Keep aquarium water at the proper temperature with these high-quality heater units. 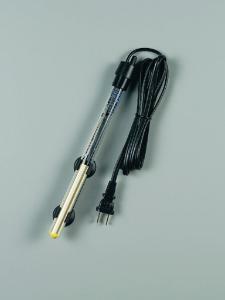 Simply attach the heater to the aquarium wall and use the direct-reading thermometer-type scale to make adjustments. These unobtrusive models also feature a heating element support system designed to reduce weight. Includes: suction cups and clips.